I had a little bit of sewing time today. 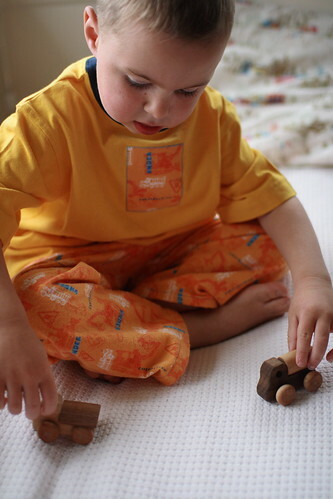 I completed a quick and easy pair of much-needed pajamas for James, and a skirt for Elisabeth. The pajamas were made using some flannel that I picked up as a remnant at JoAnn last year. It was probably about 3/4 of a yard; the perfect amount for a pair of pajama pants for a four-year-old. The "pattern" is an old tracing that I did years ago, and I've been adjusting it since then. I picked up the t-shirt at Target a couple of years ago, thinking that I'd hang onto it to applique once it fit him (I liked the color combination of the yellow and navy). It doesn't coordinate perfectly with the pants, but I had it on hand, which made the project easy to start and complete in one sitting! I made the skirt in the same way that I made this one (almost exactly a year ago -- and wow, looking at those pictures, she has changed a lot in the last year! ), but I used a 24" length of fabric so that it would be long enough for her to wear to church and other "nice" occasions. I'll continue to post my progress this week, and maybe cross things off in this post as I go.